In the 21st century, mankind lives on two planets: Earth and the now terraformed Venus. People from Earth have colonized the formerly hostile world and have thrived for four generations. But along with those humans came their failings and the dark sides. Now Venus is about to become hostile again. 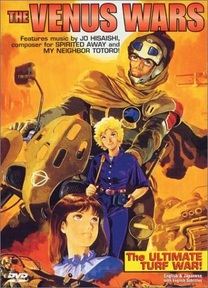 Hiro Seno, a popular hotshot motorcycle racer, caught up in a war he would rather avoid, witnesses the first strike on his country Aphrodia from the malevolent nation of Ishtar. Before his very eyes, he sees the Ishtarian war machines lay waste to his city, and despite his opposition to war, Hiro soon finds himself fighting for his life on the front lines! Meanwhile, Susan Somers, a spunky journalist from Earth, gets caught up in the whirlwind of Venutian political intrigue and espionage that brings her face to face with the deadly leader of the Ishtar himself. DVD Features: Character Profiles, Trailers.